Like us on Facebook for the latest Lena Katina and Julia Volkova news and updates as well as exclusive giveaways and contests! Lena Katina's new singles "Never Forget" and "Melody" are now available on CD on Lena Katina's Facebook page for a special discount price. Click here for more details. Lena Katina ft. Dave Aude "Never Forget" peaked at #1 on the Billboard Dance/Club Chart during the week of April 19 to April 26, 2012. Lena Katina ft. Clark Owen - "Melody"
Lena Katina collaborated with new artist Clark Owen in the single "Melody". Julia Volkova ft. Dima Bilan - "Back to her Future"
Julia Volkova and Dima Bilan performed a duet "Back to her Future" at the Eurovision Semi-Finals 2012 and came in 2nd place to Buranovskiye Babushki. Nicole Kehl was born in Salt Lake City, Utah and has been living in Los Angeles, California for the last five years pursuing her career in the music industry. She has been singing professionally for over 10 years. In addition to being a solo artist, she has done background vocals for Sisqo, Lena Katina (ex-t.A.T.u.) and now Rihanna. Nicole Kehl was first mentioned as Lena's background singer (together with Nadia Christine Duggin) at Lena Katina's fan meeting of May 29, 2010. One day later, Lena Katina debuted her brand new solo efforts with her band at the legendary Los Angeles club Troubadour. Nicole also sang with Lena in June 2010 at Pridefest in Milwaukee and in September 2010 at 1015 Folsom, San Fransisco. Julia Volkova - "Sdvinu Mir"
Julia Volkova's debut single "Sdvinu Mir" has premiered! Belanova ft. Lena Katina - "Tic-Toc"
Mexican pop group Belanova featured Lena Katina in their new song "Tic-Toc". Lena Katina - "Never Forget"
Lena Katina's debut music video "Never Forget" premiered on August 2, 2011. Cherrytree Radio's t.A.T.u. request hour will air tomorrow at 8:00 AM and 3:00 PM Pacific on www.CherrytreeRadio.com. This month's show will feature all t.A.T.u. 's most memorable songs from All The Things She Said to Obezyanka Nol to You and I. The show ends with exclusive voice messages from Julia and Lena. You can also chat with other listeners during the broadcasts at www.CherrytreeRecords.com/chat. 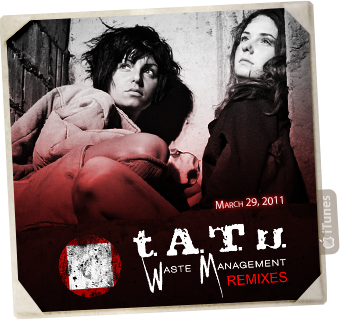 March 29, 2011 - t.A.T.u. release their double album Waste Management Remixes (WMR). In the foreseeable future, this will likely be the group's last record as Lena Katina and Yulia Volkova part ways to work on their solo projects. The album of remixes is a logical conclusion to the journey set off by the release of the duo's most debatable album, Waste Management. "I'm very glad that the participants were able to take our songs and find ways to make them their own," says Lena Katina. "If our music will help promote these talented musicians, we can say that we are truly satisfied with the results." Julia Volkova - "Woman All The Way Down" and "Rage"
Julia Volkova performed her new songs "Woman All The Way Down" and "Rage" at her birthday party on February 20, 2011 in Moscow, Russia.